The lack of viable treatment options for spinal cord injury patients has prompted preclinical research employing advanced stem cell-based therapies. Both adipose stem cells (ASCs) , which play neuroprotective and overall supportive roles, and olfactory ensheathing cells (OECs) , which support and guide neurite outgrowth and elongation, have demonstrated great potential in treating human patients and lend themselves well to clinical translation. Previous studies from the laboratory of António J. Salgado (University of Minho, Braga, Portugal) discovered that coculture promotes the proliferation and metabolic activity of ASCs and OECs . Now, Gomes et al. have assessed the potential of ASC and OEC co-transplantation in an in vitro model of axonal regeneration and in an in vivo model of spinal cord injury . Will this new STEM CELLS study lead to the development of a new and improved strategy for spinal cord injury repair? Initial in vitro analyses employing dorsal root ganglia explants as a model for axonal growth discovered that while cocultured OECs induced neurite outgrowth via cell-cell interactions, ASCs released paracrine factors that modulated the VEGF, PI3K, and Cadherin signaling pathways that influence neurite outgrowth and neuronal protection. Buoyed by these results, the authors moved in vivo and studied the effects of OEC/ASC contransplantation in a rat spinal cord injury model at eight weeks. Excitingly, co-transplanted rats demonstrated significant improvements in locomotor behavior, such as stepping, coordination, and toe clearance, and the authors linked this enhanced recuperation from spinal cord injury to a significant reduction in the numbers of inflammatory cells close to the lesion site and a slight reduction in astrogliosis. Of note, the authors uncovered evidence of ASC survival in the transplant site at the end of the eight weeks of model study. This encouraging preclinical animal study suggests that ASC and OEC co-transplantation may represent a new, improved, and highly translatable strategy for spinal cord injury in human patients. The authors hope that future studies will clarify remaining questions regarding OEC regionality, purity, and identity, the principal mechanisms and molecules mediating the effects of OECS and ASCs, the timing of contransplantation, and possible support by the additional application of biomaterials/scaffolds. To hear more details on these discussion points and all the news on novel contransplantation studies, stay tuned to the Stem Cells Portal! What biomaterials and scaffolds could potentiate the regenerative/reparative effects of ASC and OEC co-transplantation? Will ASC and OEC co-transplantation permit enduring long-term improvements to locomotor behavior? How will OEC regionality, purity, and identity affect spinal cord injury repair when combined with ASCs? Hur JW, Cho T-H, Park D-H, et al., Intrathecal transplantation of autologous adipose-derived mesenchymal stem cells for treating spinal cord injury: A human trial. The Journal of Spinal Cord Medicine 2016;39:655-664. Huang H, Xi H, Chen L, et al., Long-Term Outcome of Olfactory Ensheathing Cell Therapy for Patients with Complete Chronic Spinal Cord Injury. Cell Transplantation 2012;21:23-31. Silva NA, Gimble JM, Sousa N, et al., Combining Adult Stem Cells and Olfactory Ensheathing Cells: The Secretome Effect. Stem Cells and Development 2013;22:1232-1240. 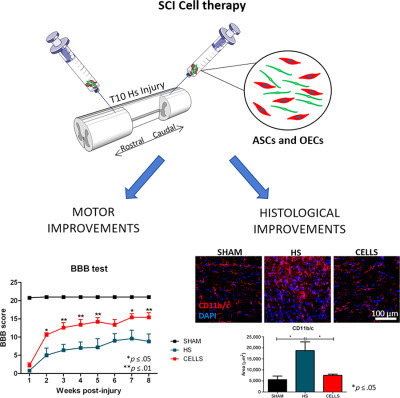 Gomes ED, Mendes SS, Assunção‐Silva RC, et al., Co‐Transplantation of Adipose Tissue‐Derived Stromal Cells and Olfactory Ensheathing Cells for Spinal Cord Injury Repair. STEM CELLS 2018;36:696-708.